We're really getting into a good stretch of episodes here. 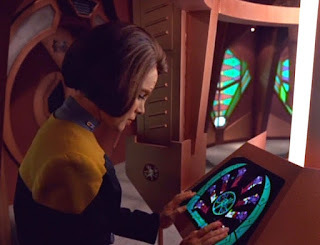 Dreadnought is all about how Past-B'Elanna (who was a genius) messed with some super deadly Cardassian junk and then sent it on its super deadly way and now that Cardassian junk is be-bopping around the Delta Quadrant and killing folks willy nilly because it's all confused and Current-B'Elanna (who is still a genius) has to smarty-pants her way out of it. This is B'Elanna literally facing the person she used to be. She even re-programmed that Cardassian junk with HER OWN voice. Oh man. I don't have any deadly artificial intelligence torpedo ships wandering around (I hope) but I do occasionally have the unexpected memory of some variation of the person I used to be. Don't get me wrong. For the most part, I've always been me. Weird. I play too many video games, watch too many cartoons, and talk to myself in grocery stores. My favorite foods are pizza and ice cream. None of that stuff has changed from the time I was ten years old. But sometimes I think about conversations I had or mistakes I made and I think, "What an idiot." But, really, what I should be thinking is, "Hey, at least I didn't re-program a torpedo ship that's going around killing people now. Because that would be really embarrassing." So I guess you could say that Dreadnought is really good for helping you put that really bad butterfly tattoo in perspective. But, even without all the added personal crap, Dreadnought is a great episode. It stands on its own as an example of Voyager doing something interesting, tense, and authentic with its existing story and characters. B'Elanna is a badass. She's tough, smart, strong, determined, and thoughtful. She recognizes when she's made a terrible mistake and she'll do anything, even put her life on the line, to remedy it. 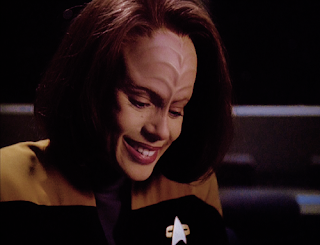 Good job, B'Elanna, when you look back at this episode, you can remember it fondly.